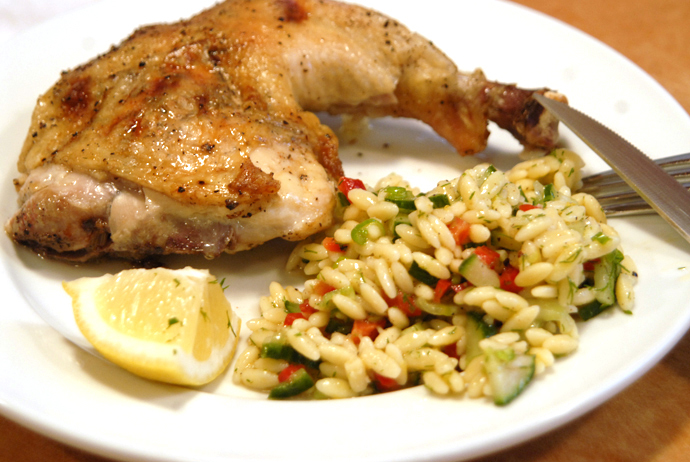 Making a ‘flatty’ chicken is quick and simple allowing for more even cooking. Using compound butter under the skin gives extra flavor and moisture. 1. FOR THE CHICKEN: Preheat oven to 350°. Remove any loose bits in the chicken cavity and either reserve for another use or discard. Rinse and pat dry inside and out. Flatty the chicken (slideshow of this below) rub both sides with olive oil and season with salt and pepper. Place chicken on rack inside a large roasting pan, tucking the wings behind the breasts. 2. FOR THE COMPOUND BUTTER: Using room temperature butter, add herbs de provence, salt, smoked paprika and garlic powder until well blended. Stuff the butter under the skin of the chicken (images shown below). Roast the chicken until internal temperature reaches 165°. Once the internal temperature is met, turn the broiler on to 500° to crisp the chicken skin to medium brown (optional). Let cool slightly and quarter. Serve on warm plates. This entry was posted in recipes and tagged baked, chicken, cooking, dinner, dish, entree, food, main, oven, poultry, recipe, roast by MixedSoup. Bookmark the permalink.